Blanks are necessary for a number of purposes. They are used when you need the flash and the sound that comes with regular gunfire, but you do not need a projectile. Blanks are used in theatre productions and war reenactments, as well as for weapons training exercises. One of the most important factors to remember about blanks, however, is that they still require a good amount of diligence on the part of the shooter in order for them to be considered “safe.” At Grab A gun, we believe in the importance of safety over all else; that is why we want to make sure that all of our customers are aware that even blanks can be dangerous when used in the wrong manner. Remember that while a blank cartridge does not contain a projectile per se, it is still possible for material to be “projected” through the end of a barrel when a blank is used. This includes the plug, or wad, which seals the powder inside the case – a plug which is usually made of wood, paper, or plastic. Both the wad and the muzzle blast can be dangerous at close ranges. Therefore, be aware of your surroundings at all time, even when using blanks. A responsible gun owner is the only type of gun owner we all want to be. At Grab a Gun, we carry a wide variety of blank cartridges, including snap caps. 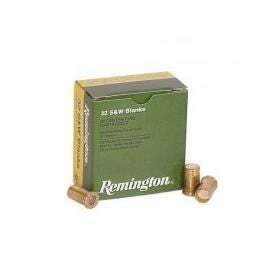 We carry blanks in a number of calibers in order to suit a range of firearms. If you’re unsure what you need, simply reach out to our customer service team – we would be happy to point you in the right direction. Look to GrabAGun.com for all of your firearm, ammo, and accessory needs.